New York Times bestselling author Ruth Soukup feels STUFF. It's everywhere. Lurking in corners and closets, spilling onto counters and coffee tables, creating havoc everywhere we look. And it's not just the physical clutter that weighs us down. Oh no, it is the stress of overbooked schedules, and the weight of life that sometimes feels oppressive and totally out of whack. To ask other readers questions about Unstuffed, please sign up. On one hand, this was an enjoyable read- light, full of engaging stories and ideas, and I think Ruth is a good writer. She definitely knows how to present information in a helpful way that is easy to act on right away. On the other hand, I realize I am probably not the right audience for this read for the stage of life I am in (transitioning to life in the States after having lived in a developing country for se I received an ARC from Netgalley and the publisher in exchange for an honest review. On one hand, this was an enjoyable read- light, full of engaging stories and ideas, and I think Ruth is a good writer. She definitely knows how to present information in a helpful way that is easy to act on right away. On the other hand, I realize I am probably not the right audience for this read for the stage of life I am in (transitioning to life in the States after having lived in a developing country for several years) and I could not fully appreciate it. I had a couple gnawing thoughts as I read. One was that it makes me incredibly sad that the problems that this book addresses plague us. They are definitely “first world problems”, and, having recently lived outside the States, it made me ache that there is such an imbalance in the distribution of resources in our world. One family is drowning in stuff and another can hardly put food on the table. I could not read this and not think about homes I had recently been in that had such few items I wondered how they managed. I was distracted thinking about how to remedy the unequal distribution and wanted a greater focus on how to channel the stuff to the people who could use it. I know that Soukup’s goal is not to write about charity and that she is helping many families with this book, so I don’t want to minimize that; I just had memories too fresh in my mind of families in dire need that made me see the content of this book with different perspective. All that said, I have had a tendency to hold onto stuff for the wrong reasons, such as sentimental gifts or cards, or stuff I “might” use one day (Ruth addresses how to reframe our motivations for keeping this kind of stuff in a very helpful way). The book unpacks a variety of the reasons for accumulating clutter, physically, emotionally, and spiritually, and helps us to reflect on how to feel okay about getting rid of it and moving forward. I think my favorite part of the book was the last chapter where she is very vulnerable in sharing her own struggles; I really admired her honesty and knowing her story allows the reader to really appreciate where the writer has come from. "Unstuffed" is a great book that went deeper than the typical "just stop getting stuff and get rid of it" books out there. Her book, written in a highly personal and conversational style (which makes it a little more endearing) offers really (emphasis on the really) practical suggestions on how to implement a mindset that is "unstuffed" in everything- -email (she helps provide a framework for establishing filters), letters from school, clothes, bills, relationships. It's really the most comprehe "Unstuffed" is a great book that went deeper than the typical "just stop getting stuff and get rid of it" books out there. Her book, written in a highly personal and conversational style (which makes it a little more endearing) offers really (emphasis on the really) practical suggestions on how to implement a mindset that is "unstuffed" in everything- -email (she helps provide a framework for establishing filters), letters from school, clothes, bills, relationships. It's really the most comprehensive book (which is surprising because it's only a few pages over 200) on simplicity that I have ever seen. It also wonderfully ties simplicity with faith so well. A lot of authors just stick a chapter on "Faith" in somewhere, but in "Unstuffed" you can feel spirituality throughout the whole book. I am not the target audience for this book. 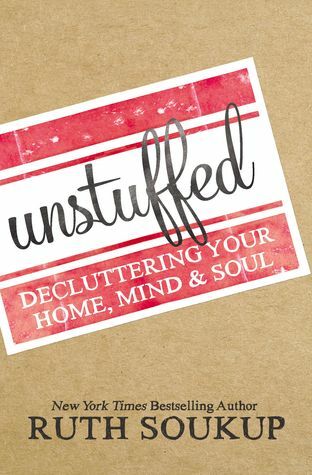 While there are some good tips about decluttering to be had here, there is a Christian spin that suggests becoming unstuffed requires grace. Food for thought, but not necessarily the message one needs when looking for a practical way out of clutter. When picking up this book, it's important to realize from the start that the book will not focus solely on decluttering physical possessions. Thankfully, the subtitle conveys this right away: "Decluttering your home, mind, and soul." The book is organized into three main sections (Home, Mind, and Soul), with three chapters in each section tackling different components, like living areas, storage, kids, schedule, paperwork, gifts, and soul aspects of living (friends, wellness, and spiritual). The author uses both personal anecdotes along with practical step-by-step lists to offer what she's learned and researched about decluttering our lives - physically and mentally. She incorporates a few faith-based statements throughout, but especially focuses on spiritual 'decluttering' and focus in the very last chapter. A few aspects to consider: This book will be most helpful to its intended audience, which is first world, middle class with an overabundance of material stuff and crowded schedules. If outside of that group, this book will either be not useful, or possibly frustrating. However, considered within the intended audience, she begins with the physical stuff because many readers feel like that can help them gain some sanity if they're in a position many middle class Americans are with too much all around. The practical tips begin right away (on page 17), and her ideas will likely help much of her intended audience. If readers have researched decluttering techniques at all, many of her tips will have been heard or read before, but can still serve as good reminders. Perhaps more helpful is how she includes examples of applying those tips before or after each such numbered list of tips. The second section of the book is perhaps more useful because it deals with the why of decluttering (and why we get so cluttered in the first place), which allows readers to reflect and look at ways to change (and ways to accept grace). I particularly appreciated her thoughts on balance. Not only was this book filled with helpful advice and tips for getting rid of stuff, but it was actually really interesting. The The author has the same problem most of us have - too much stuff. Our homes are filled with things, our schedules are packed and our lives are headed towards crazy. She's taken a simple, yet effective approach and has mixed stories of her personal experience and sound advice from experts to talk about how we can lessen not only our stress, but our dependence on things. This was a slightly different book on decluttering. The author's very upfront about it - it's not an instruction manual with step-by-step guides to getting your house and/or life together. She tells you that this is more about the mindset - "becoming unstuffed is much more than getting rid of the things you no longer want...It's changing the way we look at our homes and the stuff we live with. It's changing the way we look at our schedules and the stuff that fills our time. It's changing the way This was a slightly different book on decluttering. The author's very upfront about it - it's not an instruction manual with step-by-step guides to getting your house and/or life together. She tells you that this is more about the mindset - "becoming unstuffed is much more than getting rid of the things you no longer want...It's changing the way we look at our homes and the stuff we live with. It's changing the way we look at our schedules and the stuff that fills our time. It's changing the way we look at our relationships and the stuff they are made of." This is more geared towards those with children. It also has a strong element of religion injected into the suggestions which was a little different perspective. The very first step toward becoming unstuffed is being realistic about how we actually use our homes rather than how we think we should use them. ...becoming unstuffed ultimately means removing everything that doesn't contribute to the way we want our homes to feel, while keeping everything that does. ...allowing your mind and body to take a break even when there is more to do. Because there will always be more to do. Every day. For the rest of our lives. Excellent insight into why we hold on to possessions, ideas, memories (good and bad), and how to reframe thinking and habits to live an uncluttered life. I would’ve liked it more if it wasn’t so focused on Christianity and stayed generic with faith and purpose. I’m pretty sure Jesus isn’t necessary to stop buying (and buying into) too many things or clinging tightly to unnecessary junk (physical or mental). It doesn’t matter where a person draws their strength, as long as they have it. Anyone ca Excellent insight into why we hold on to possessions, ideas, memories (good and bad), and how to reframe thinking and habits to live an uncluttered life. It doesn’t matter where a person draws their strength, as long as they have it. Anyone can work through issues discussed here. That said, I’ve taken a lot from this book and recommend it to those who could use a clear space and mind. The first thing you need to know is that I *LOVE* throwing things away, decluttering, and organizing, so this book is "my kind of book!" However, because I have a natural bent to purging (I make at least one trip a month to donate to charity and sometimes I go multiple times in the same month), I often don't learn anything new when reading books like these. But not this book! Soukup is not only an engaging writer on what could be a VERY mundane subject, she's an honest one. One of my favorite id The first thing you need to know is that I *LOVE* throwing things away, decluttering, and organizing, so this book is "my kind of book!" However, because I have a natural bent to purging (I make at least one trip a month to donate to charity and sometimes I go multiple times in the same month), I often don't learn anything new when reading books like these. But not this book! Soukup is not only an engaging writer on what could be a VERY mundane subject, she's an honest one. One of my favorite ideas in this book is the suggestion to limit Christmas gifts to three to represent the number of gifts brought by the wise men. Or this idea: "something you want, something you need, something to wear, and something to read." the features I adored about Soukup's latest book is the gray-colored blocks with gut-level honest LISTS from the Unstuffed Weekend Challenge to "If this, then that" rules for clutter to How to graciously decline a gift. Even though I put a lot of her points into action already, Unstuffed extends beyond material possessions to finances: "Money comes from work" and all stuff is purchased with money. She also addresses decluttering mind and soul, which includes learning to say no and evaluating toxic relationships. I found this book to be very informative - both for the "duh" of course i "should" do that , so the, hunh, good idea. Like putting away nick nacks - i did that and felt so much better. I didn't toss them, i now take out the box every month or 2 months and rotate what is on display! The only other downside is the preachy/churchy parts - but you can overlook that. And i just skipped right over the kid chapter. But all in all, i found it a nice read and something to get you going on your way to limit I found this book to be very informative - both for the "duh" of course i "should" do that , so the, hunh, good idea. Like putting away nick nacks - i did that and felt so much better. I didn't toss them, i now take out the box every month or 2 months and rotate what is on display! Repetitive. Nothing new or mind- blowing that I haven't read in other books or on other blogs. She includes examples from her own life that are nice to relate to. Soukup takes on more than our messy houses... she also attacks our messy minds and relationships. Her Christian perspective adds some soul to the tips. This book contains some useful information. Nothing new but I like hearing different perspectives on decluttering/minimalism/organization - whatever you want to call it - so I read it. I was really annoyed by some of the lists the author gives though. Sometimes they're completely unnecessary to prove her point. For example, at one point, she says "I want to say yes to my kids, who are vying for my time and attention and need their mom. I want to say yes to my husband, who for the most part is pr This book contains some useful information. Nothing new but I like hearing different perspectives on decluttering/minimalism/organization - whatever you want to call it - so I read it. I was really annoyed by some of the lists the author gives though. Sometimes they're completely unnecessary to prove her point. For example, at one point, she says "I want to say yes to my kids, who are vying for my time and attention and need their mom. I want to say yes to my husband, who for the most part is pretty patient and long-suffering but who needs to know he is more important than everything else I have going on." It goes on with like 12 other things she wants to say yes to. It doesn't end there. In the next paragraph, she hashes out why she shouldn't say yes to everything: "My kids are disappointed because I am distracted. My husband is irritated because I never have enough time to just sit and talk." I'm all for parallelism in writing but this author does it way too much for my taste. I had to skim a lot of sections because of it. "Don't say yes to everything because people you love suffer." Ok, got it. That's all I need, I don't need super specific examples about your life. This book is about so much more than overcoming clutter. It is about unstuffing your whole life. Yet the author makes a great point when she describes how people can hang onto items through guilt after the loss of a loved one. It can make people feel guilty to get rid of an item that belonged to their dearly departed loved one. She stresses the point that we should treasure memories not things. After decluttering our houses she shows us how to declutter friendships. She shows us how sleep is important to our health and other ways to destress our lives. The author finishes with an emphasis on the spiritual and how she became a Christian. Be realistic about how we use our homes. "Filling our homes with things we don't need based on a fantasy that will never actually materialize is nothing more than an exercise in frustration." Aspirational clutter has always been an issue for me. The past few years, I've gotten better and better about letting things go I won't realistically get around to doing whatever I thought I might do with it. Okay, her weekend declutter plan sounds insanely exhausting (90-minute sessions divided by 15-min brea Be realistic about how we use our homes. Okay, her weekend declutter plan sounds insanely exhausting (90-minute sessions divided by 15-min breaks to get a drink and/or use the bathroom), but she also has a 30-day plan too. She does have a lot of useful tips, though not really anything new. While a lot of the book focused on unstuffing in relation to family and children (which I don't have), I did find several things that could relate to me. Of course, the mind and soul sections were my favorite- we can all use tips and tricks on how to unstuff our life, and it helps to know there are situations in which we are not alone! One specific section, on friendship, really spoke to me. There are different kinds of friends- those we can trust and depend on, superficial ones that we can stil While a lot of the book focused on unstuffing in relation to family and children (which I don't have), I did find several things that could relate to me. Of course, the mind and soul sections were my favorite- we can all use tips and tricks on how to unstuff our life, and it helps to know there are situations in which we are not alone! One specific section, on friendship, really spoke to me. There are different kinds of friends- those we can trust and depend on, superficial ones that we can still hang out with and have fun with, but aren't really as deep as others, and toxic friends that it's ok to break those ties with. Soukup does a great job of validating thoughts we didn't even know we had, and giving ideas on how to move forward in unstuffing our life. I loved this book and could easily read it again and again. While Ms. Soukup deals with our physical clutter, she really addresses the spiritual aspects behind it. I read this over the summer and again in the fall of 2018. Now March of 2019 and I could probably read it again! I'm not remembering exactly, but my sense is also that she encourages us to examine ourselves in relation to our possessions rather than mandating what she thinks we need and don't need. This is about the 3rd book I've read on decluttering. Have been working on this process for a few years now and this book gave me another boost to get going. Most of the tips are pretty common sense but now and then you just need a reminder. The author uses her own life experiences to explain her reasons why decluttering your home, mind and soul is so important not just for yourself but for your whole family. Figuring out what really matters is what is important. The title gives it away - what the book is about. A lot of the information for things that we probably heard elsewhere, but it’s always good to be reminded. The best part of the book was something called The Unstuffed Weekend Challenge. This is a step by step, hour by hour process of how to de clutter and unstuff your house from Friday night to Sunday night. I actually did this a few months back. It was a great way to tackle stuff.